Crystal structure is clearly visible and some pieces also display olivine, calcite or quartz. 3 pieces per pack. Pieces are varied in size up to 4cm in length. Crystals are parallel and elongated acicular (needle-like) trigonal prisms. 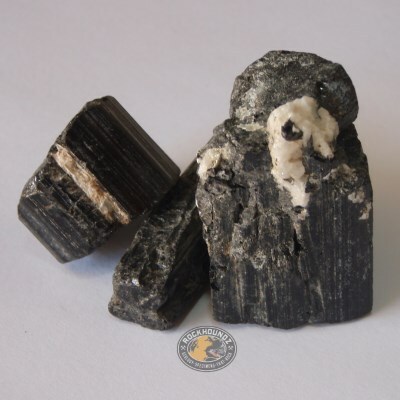 Scattered grains of black tourmaline can be seen in granite, sandstone and conglomerate. Also seen in schist and marble. Crystal structure is clearly visible and some pieces also display olivine, calcite or quartz. Lovely display specimen for the classroom or for teaching. The specimen can be handled by students without damaging the crystals.